Spring is finally here and there are lots of fresh new ideas for non-profits in a host of free webinars popping up this May! Webinar topics include: Copywriting for the Web, Managing Aging Volunteers, How to Think Like a Search Engine, Planning a Nonprofit Blog and much more! Have a look at the list below and find time in your schedule to help build your non-profit knowledge base. And don't forget to share them with your friends and colleagues! Are you struggling to find sponsors? If you want sponsors to say yes, you need to know how and what to sell. And spoiler alert, they're not just interested in what's good for YOU. They too want to profit from the partnership. Joe Waters knows what both partners want and need. And he's going to share his insight during this free Expert Webinar. Identify assets within your organizations that will appeal to potential sponsors. Detect sponsors from the pool of businesses you currently know and interact. Present and close your proposal with confidence and passion. Add a special "twist" to sponsorship that could raise you a lot more money. Joe Waters is an expert at creating win-win partnerships for do-gooders, nonprofits, associations and businesses. He is a professional speaker who has presented to hundreds of organizations and the author of several books including Fundraising with Businesses, Cause Marketing for Dummies and QR codes for Dummies. And Joe has the #1 cause marketing blog: selfishgiving.com. So many programs and organizations depend on volunteers that have been with them for years. What happens when those volunteers start to get older? If your volunteers are aging, this session can help. In this VolunteerMatch webinar, learn strategies for identifying the signs of aging in place - volunteers who continue to do the same work even though their capabilities have changed - and how to start a conversation about that change. Managing the transition as well as creating new options for aging volunteers will be covered, and we'll discuss what to do when the situation can't be solved amicably. Participants will have the opportunity to discuss challenges. What is your brand? And why does it matter? In this 4Good webinar, author and consultant Michele Levy brings a practical approach to the topic of nonprofit branding. Learn from her real world examples, and walk away with tactics you can implement in your own organization. VolunteerMatch is now sharing your skilled opportunity listings with LinkedIn's 300+ million potential volunteers. Integrating skilled volunteers into your existing volunteer program is both exciting and scary. If you're thinking about adding skilled volunteers to your program, or if you've just started, this seminar can help you make the experience successful for both the volunteer and the organization. Navigating the introduction of the idea into your organization, developing the art of delegating work to volunteers, and setting achievable outcomes will be covered. Are donors decreasing their gifts to your organization each year? Worse yet - is your organization losing donors each year? These are not uncommon problems for nonprofits to struggle with, but there is a common solution. Donor stewardship! Providing your donors with excellent stewardship is the best way to increase their gifts each year and retain more donors. This CharityVillage webinar, presented by Vanessa Chase of The Storytelling Non-Profit, will cover why donor stewardship is one of the best ways to grow your fundraising revenue, provide will nonprofit professionals with ideas for creating a donor stewardship plan that uses cost-effective stewardship tactics, and will outline five tips to create a donor stewardship plan. Of course, your organization absolutely must have a nice-looking website. But it also must contain content that your users really want to engage with AND can easily find! Your website is a key part of your organization's outreach/marketing effort and needs to speak to your readers their way. This TechSoup webinar will offer you plenty of tips and techniques to make sure your content is web reader-friendly, while it stresses your community impact. Do you wonder why your nonprofit's or library's rankings on search engines are always low? Wish you had a better understanding of how to improve search results that bring your organization to the top of the page? Join TechSoup's Online Marketing and Analytics Manager James Metzger for a crash-course on how to think like a search engine so you can get your organization's message heard and found across the web! And give you an SEO style guide so you can improve your organization's organic reach! Powerful stories are an important tool demonstrating your organization's impact, and blogs are an ideal place to share these stories with the world. But there’s no question; creating and managing a blog for your nonprofit organization requires a significant commitment and investment of time. This CharityVillage webinar, presented by Marlene Oliveira, will show you a number of steps you can take to make blogging manageable, including: creating content ideas and how often you should post; contingencies to keep your nonprofit's blog running as smoothly as possible; editorial guidelines and how to work with multiple contributors; and essential decisions and plans to streamline the role of the blog's managing editor. NOTE: This webinar combines elements of Grantseeking Basics. Are you new to the field of grantseeking? Discover what funders are looking for in nonprofits seeking grants and how to find potential funders in this newly revised class. How to Get Tech Donations Before Fiscal-Year-End! The June 30 fiscal-year-end for many nonprofits and churches is right around the corners, so now is the time to exhaust all of the donations your organization is eligible to receive between now and then! Join this webinar to walk through different donation programs through TechSoup, learn which ones reset on July 1, and get the most out of tech donations right now. We'll poll YOU, our participants, live on the webinar, to help ensure that the hour is most useful for you. We can tour the registration process, walk through requesting donations, go in-depth on specific donation programs and products, discuss eligibility and restrictions, and much more. 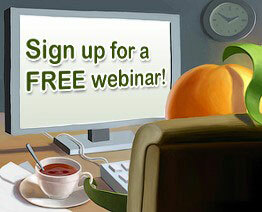 If your organization offers a free webinar that would be of interest to non-profit, membership, or volunteer-based organizations and you want to include it in next month's post, please email a brief overview (like those above) to lori@wildapricot.com no later than May 18th. And, as always, if you know of a free webinar that we've missed for this month – please share the details with us in the comments below.